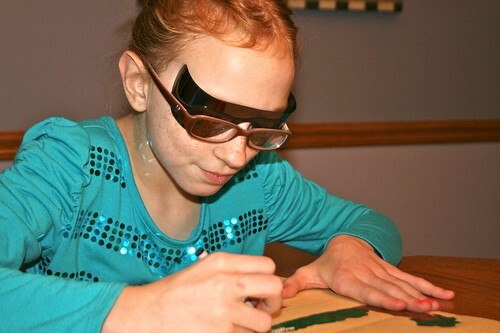 For a few weeks Mattey had been subtly hinting that she needed to see the eye doctor because she couldn't see. I guess I'm not all that good at subtlety sometimes because it took her telling my mom and me again clearly that she couldn't see at school. I finally remembered to make the call and got her an appointment. Mat really doesn't like the part when the doctor numbs her eye and all that goes with that part of the exam. But she does love the shades that come with it. Her Rx went from 1.75 to 2.50! That's a big difference. I put a rush on the order of her new glasses. They should be here Monday.